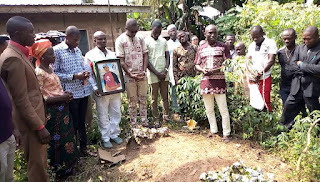 IMO – It was a warmth surprise for indigenes of Okohia community in Imo state on December 2, 2018 as family members of the Indigenous People of Biafra, IPOB, Gasline zone, a well-known resilient zone in Aba, Abia State, paid homage to the family of their deceased member, Ifeanyi Azubuike, popularly known as Awara Junior, who lost his life in the hands of the murderous Nigerian military during the Biafra Heroes’ Day commemoration on May 30, 2016, at Nkpor, Anambra State. The visitation took place in their hometown of Okohia Autonomous Community in Onuimo Local Government Area of the state. It was a heartrending and harrowing moment for IPOB members and other visitors who watched as endless flow of tears rolled down the cheeks of the mother of Awara Junior, Mrs. Ann Azubuike. Ifeanyi Azubuike was sent to his early grave by the trigger-happy and blood-sucking Nigerian military for merely exercising his right to self-determination. He was never found with any form of destructive arm, his only crime being his open support and unflinching love for his fatherland, Biafra. Two days before IPOB members took off to Nkpor where he was killed he said, “Count me out of that country whose citizens fear truth. A life without freedom is a life devoid of meaning.’’ As the supreme leader of the Indigenous People of Biafra, Mazi Nnamdi Kanu, would rightly say, Biafra will not come by deceits and hallucinations, but by standing on truth always, regardless of the consequences. Ifeanyi remained truthful and dedicated to the struggle till death. 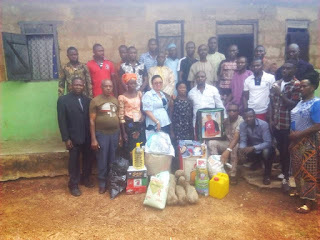 The IPOB family in Gasline zone, Aba, donated foodstuffs and other gifts to the bereaved mother while consoling her for the irreparable loss. 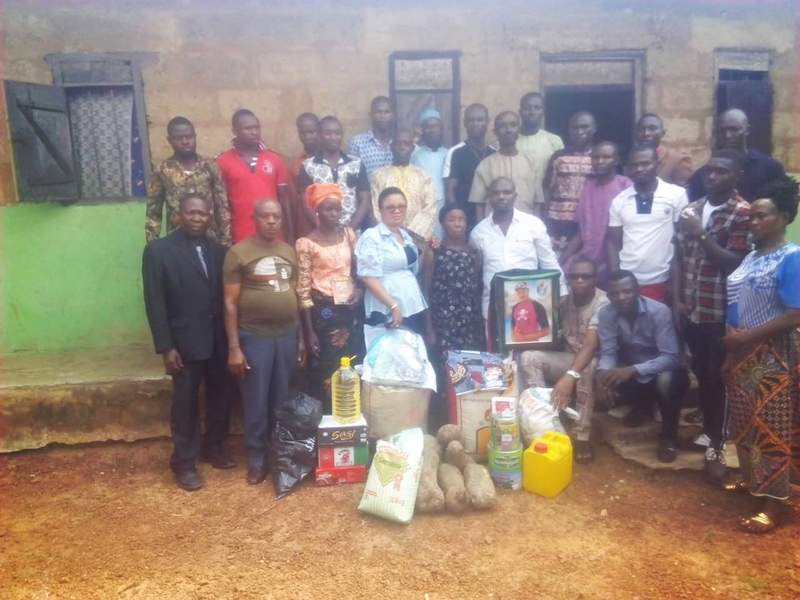 The presence of IPOB family members enlivened Mrs. Azubuike who later expressed immeasurable gratitude to the visiting party. A mournful procession to the graveside followed. There, mother earth again received bitter tears from IPOB family members. Mr. Ugochukwu Asochukwu Bonaventure, Coordinator of Gasline Zone, in a brief interview with Biafra Writers’ correspondent, assured that the IPOB family will always be there for Ifeanyi’s mother whenever she is in need. Indeed, an apple does not fall far from its tree. Ugochukwu Asochukwu Bonaventure has had his own share of terror having spent five months in DSS dungeon alongside Biafra land Coordinator, Ikechukwu Ugwuoha, for exercising their right to self-determination. The conduct of IPOB worldwide under the leadership of Onyendu Mazi Nnamdi Kanu, have shown that Biafra, when restored, will be a beacon of hope to the black man world over. Thanks to Mazi Nnamdi Kanu for training millions of Biafrans who are ready to stand their grounds for what they believe in. To the Dracula and draconian Nigerian government, they are just chasing shadow. IPOB can never be defeated. The only message for Nigeria is let them prepare for the worst that, for the reign of an evil entity like her is as ephemeral as the grass.